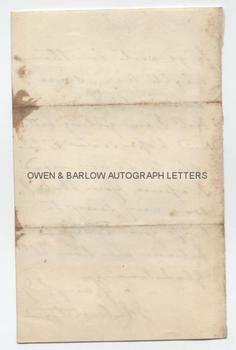 EMILY PALMERSTON Autograph LETTER Signed. Lady Emily Palmerston (formerly Lady Emily Cooper nee Lamb). Wife of Prime Minister Viscount Palmerston. The final page of a longer ALS. 1p. No place, no date but the paper appears to be watermarked 1865. To Mrs [Catherine] Gladstone (wife of Prime Minister W. E. Gladstone). ". . . to go out in the night air since I came to Town - but I am getting better and hope soon to be able to do so - and I assure you that I was very sorry to miss your Party. 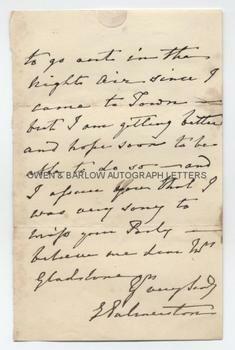 Believe me, Dear Mrs Gladstone, yrs very sincerely, E. Palmerston." 8vo. Approx 7 x 4.5 inches. Remains of old mounting hinge at top edge. Some staining to verso, else very good. Palmerston's final term in office as Prime Minister came to an end on 18th October 1865 when he died of a chill. His final words being reported as "Die, my dear Doctor? that is the last thing I shall do." At this date, W.E. Gladstone was his Chancellor of the Exchequer. Although the two men were cordial towards one another, they disagreed fundamentally on a number of important issues. How to handle Gladstone had been one of the great questions of his last administration. Lady Emily had married Palmerston in 1839 following the death of her former husband, Lord Cooper. She was a noted Whig society hostess and the daughter of Prime Minister, Lord Melbourne, and she was Palmerston's mistress for many years before their marriage. Indeed, although the couple had no children during their marriage, Palmerston is reputed to have fathered her daughter, Emily, whilst she was still married to Lord Cooper. Lady Emily Palmerston survived her husband for only 4 years and died in 1869.